Regular, full-fat burritos are delicious but not diet-conscious. 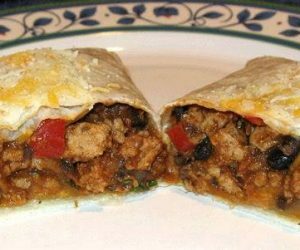 For those of you who love Mexican food, this slimmer version — which substitutes turkey and reduced-fat cheese for ground beef and high-fat Cheddar — can become a staple. Serve it with Black Beans and Rice for an authentic, but healthful, meal. Coat a large saucepan with no-stick spray and warm over medium heat. Add the turkey, onions and garlic and saute for 8 to 10 minutes, or until the turkey is no longer pink. If necessary, add a small amount of water to the pan to prevent sticking. Stir in the beans, tomato sauce, picante sauce, chili powder and salt (if using). Cover and cook, stirring occasionally, over low heat for 10 minutes. In a small bowl, toss together the fat-free Cheddar and the reduced-fat Cheddar. Coat a no-stick baking sheet with no-stick spray. Place a tortilla on a flat work surface. Spoon a generous 1/2 cup of the turkey mixture onto the tortilla, positioning it slightly off-center. Sprinkle with a scant 2 tbsp of the cheese mixture. Carefully roll up the tortilla and place, seam side down, on the prepared baking sheet. Repeat with the remaining tortillas, turkey mixture and cheese.